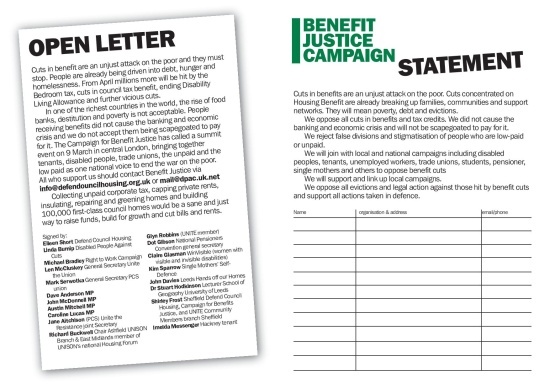 The Campaign for Benefit Justice is uniting all those opposed to devastating benefit cuts. By linking up we can challenge the Government’s divide and rule tactics and unite the 99% of people hit by these cuts. This summit will bring together disabled people, tenants, unemployed , trade unions, students, pensioners, single parents, and others to oppose benefit cuts. Click here to book your place on the Summit being held on Saturday 9th March at University of London Union (ULU), Malet St, London WC1E 7HY at 11am. If you’d like to get involved in the Benefit Justice Campaign, they would be glad to have your support. Contact trades unions, tenants and community organisations to invite them to our Summit on the 9th March 2013. Create a local Benefit Justice network, and keep us abreast of your activities by emailing us at benefitjustice@gmail.com. Support the protests in London and across the country on 20th March 2013. 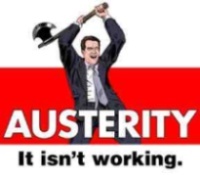 Cuts in benefit are an unjust attack on the poor and they must stop. People are already being driven into debt, hunger and homelessness. 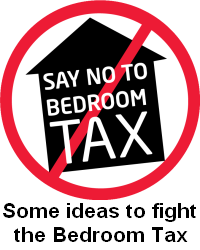 From April millions more will be hit by the bedroom tax, cuts in council-tax benefit, ending disability living allowance and further vicious cuts. In one of the richest countries in the world, the rise of food banks, destitution and poverty is not acceptable. People receiving benefits did not cause the banking and economic crisis and we do not accept them being scapegoated to pay for it. 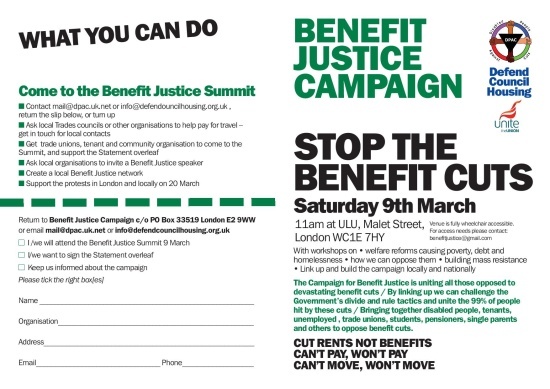 The Campaign for Benefit Justice has called a summit event on 9 March in central London, bringing together tenants, disabled people, trade unions, the unpaid and the low paid as one national voice to end the war on the poor. All who support us should contact Benefit Justice via info@defendouncilhousing.org.uk or mail@dpac.uk.net [or benefitjustice@gmail.com]. Collecting unpaid corporate tax, capping private rents, insulating, repairing and “greening” homes, and building 100,000 first-class council homes would be a sane and just way to raise funds, build for growth and cut bills and rents.